Six Nations 2015: Can depleted England beat Wales in Cardiff? Sweet dreams and screaming nightmares are made of this: 70,000 cavorting Wales fans chanting, "Easy! Easy!" 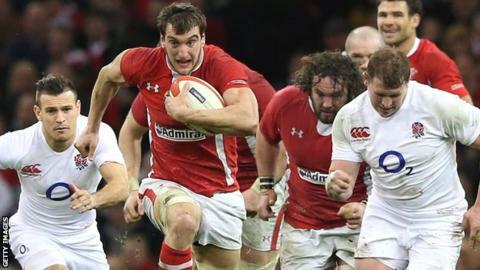 as their side butcher England by a record-breaking margin to steal the Six Nations title away. Two years have passed since that dramatic dismemberment at a heaving Millennium Stadium, but as Wales and England prepare to meet in Cardiff again this Friday evening, memories and war-wounds are being opened afresh. No matter that England recorded their own comprehensive victory over the men in red less than a year ago. So lengthy is their injury list this time around that one half expects to find blood-soaked gurneys nose to tail in the wood-panelled corridors of their Surrey training base and spot Stuart Lancaster dashing to the training pitch with a saline drip in one hand and a cry of 'Nurse!" on his quivering lips. Lancaster, of course, is a man whose upper lip at least is instinctively stiff. Thus there have been no complaints that he is returning to the scene of his most chastening night as an international coach shorn of at least six first-choice starters and with five players who have never before started a Six Nations match. His opposite number Warren Gatland has been in typically bellicose mood, naming his own team two days early and enjoying a little light jousting at England's preference for keeping the Millennium Stadium roof open. He can afford to. Just as his starting XV two years ago began with 357 more caps, so England are ceding 290 this time and grateful that 95-cap Adam Jones has just retired. England? They have won only one of their last six matches in Cardiff, have a centre pairing that has never played together before and a fly-half who is so fresh-faced that he watched the defeat in 2013 from his parents' sofa. "I've tried to bury that memory as much as possible," admits recalled flanker Tom Croft, whose last match in an England jersey came that March evening. For all Lancaster's bullish talk and the welcome strength in depth that the Premiership and England age-groups provide their head coach, Croft's return to the bench exposes how stretched English resources have become. With first-choice locks Courtney Lawes and Joe Launchbury among the injured, Lancaster has not been able to name a specialist second row of any experience among his replacements. Instead, Croft and his fellow back-row, the recalled 36-year-old Nick Easter, will provide emergency cover. "We'll play heads or tails to see who goes on," jokes Croft. In front of the old stagers stands a pairing with just 20 caps between them, 72 fewer than the Welsh second row. Dave Attwood has never played in Cardiff. His partner, 24-year-old George Kruis, is yet to start for his country anywhere. Even this game was nearly lost to a ban for a dangerous tackle for his club side Saracens, a punishment which expired, with serendipitous timing, only this Tuesday. A booze-soaked Cardiff on a Friday night is no place for the innocent. So what makes the fresh-faced Kruis - just four caps as a replacement to his name - believe he can handle it? "I like to play in front of the biggest and best crowds," he says, sporting a burgeoning beard to match that of his partner Attwood. "There is definitely a bit of nerves. But that's probably a good thing. We've trained well for the last 10 days, and we're looking sharp." Kruis's first memories of the fixture are of Shane Williams stepping and slicing through the English defence, befitting a kid who was a willowy winger until his 14th birthday. Some of that athleticism remains, harnessed to the more prosaic but essential second-row arts learned from his old club mentor, former England captain Steve Borthwick. "He was the ultimate line-out obsessive," admits Kruis. "I've never met anyone who does as much preparation. He was a master at it for years, so you can only take things from his game and add them to yours. "Here with England we have a meeting at the beginning of the week to decide how we'll call the line-outs and which the key ones are going to be. We analyse what the opposition do, see what works and then cut down the bank the closer you get to the game. "You look at the tapes for the opposition's triggers - what they do in which part of the field. You want to build as much confidence as possible so that you know what you're doing and hopefully what they're doing." The youngest of three brothers, Kruis puts his competitive nature down to that fierce sibling schooling. He also asserts, with the sort of ingenuous confidence of one yet to experience this particular fixture, that the punchy atmosphere at places like Northampton's Franklin's Gardens ground (capacity: 13,500) can be as intense as any atmosphere in world rugby. There are other, more logical reasons for England's support to be optimistic. For all the talk of the Whooping on Westgate Street two years ago, the majority of recent matches between these two sides had been settled by a margin of 10 points or fewer. There is experience in key areas, notably the front row - boosted by the return of 45-cap Dan Cole - and scrum-half, not to mention extra beef in the back row compared to 2013, when the triumvirate of Sam Warburton, Justin Tipuric and Talupe Falatau overpowered their wilting opposite numbers. There is the lesson of 2011, when another callow England team went to Cardiff and won in style. And should defeat come instead, remember four years ago for a different reason: the team that won that day headed home from the World Cup later that year in pieces on the pitch and in disgrace off it, while the losers - on the back of just two wins from their last 14 games, no less - ended just a slightly short Leigh Halfpenny penalty away from the World Cup final. History and logic favours Wales. But it is unlikely to be as "easy, easy" this time around.